Enjoy an all new match-3 game! 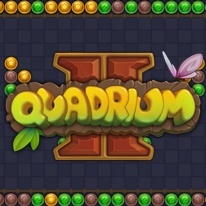 A sequel to the Quadrium game in an unusual match3 setting. New bonuses and antibonuses, new strategies. Mines allow you to clear the field with a chain reaction of explosions. Fans of added difficulty can now select Challenge Mode at any time. Completing the game will now be even more fun, because bosses have appeared!